All the cowboy targets are made from 3/8" thick AR500 hardened steel for extreme long life and excellent impact resistance. The steel targets are mounted to the stands with Grade 8 hardened carriage bolts which will resist bullet strikes. This metal cowboy silhouette target features sturdy stands and main post made from 1.5" x 1.5" x 0.25" steel angle. The "V" of the post is directed toward the shooter and will effectively resist handgun bullet strikes. The posts are angled so the cowboy silhouette shooting target will hang at a downward angle to control bullet splatter. The posts fit into a socket in the base and can be assembled without tools for ease of transport and setup. All the cowboy targets in this section can be mounted to either the 3 ft, 4 ft, or 5 ft target stands. Custom Metal Products is the premier source of pistol targets and rifle targets. The Bird/Can thrower is an exciting test of the shooter's shotgun skills. When the main target is hi.. The 17 target Gauntlet set includes six 18" x 24" rectangles, ten 10" diameter circles, one 12"; dia.. The High Noon Target Set includes two Cowboy Silhouettes, one Cowboy #2, and two shotgun auto reset .. The Posse Set includes four Cowboy silhouettes 24" tall x 15" wide. The targets are mounted on four.. The Cowboy Popper target mounted to the large Auto Reset base allows the target to lean back approxi.. The Stampede Target Set features 9 separate targets on stands that can be arranged to create a shoot.. The Cowboy Plate Rack features five Cowboy targets made from AR500 Steel, 3/8" thick. AR500 steel ab.. The Train Set features 5 steel shooting targets in the shape of a locomotive, coal car, passenger ca.. The 4 Circle Cowboy target set features four 12" diameter targets surrounding a 24" Cowboy target. .. The Cactus Popper is a manually reset popper target using the rope provided. The targets are made fr.. The Cowboy #1 Popper is a manually reset popper target using the rope provided. The cowboy action ta.. The Cowboy #2 Popper is a manually reset popper target using the rope provided. The targets are made.. The Rectangle Target is an 24" tall x 18" wide target. It can be mounted to the 3 ft, 4 ft, or 5 ft.. The Shotgun Poppers are 16" tall targets with an 8" diameter main target area. When hit the steel sh.. The Cowboy #1 is a 24" tall x 8" wide target. It can be mounted to the 3 ft, 4 ft, or 5 ft target s.. The Cowboy #2 is a 24" tall x 16" wide steel gun target. It can be mounted to the 3 ft, 4 ft, or 5 f.. The Club target is a 12" static target. It can be mounted to the 3 ft, 4 ft or 5 ft Stands. The targ.. The Cowboy Target is a 16" tall silhouette. It can be mounted to the 3 ft, 4 ft or 5 ft Stands. The .. The Cowboy Silhouette target is a 24" tall x 15" wide target. It can be mounted to the 3 ft, 4 ft, o.. The Spade target is a 12" static target. It can be mounted to the 3 ft, 4 ft or 5 ft Stands. The tar.. The Heart target is a 12"; static target. It can be mounted to the 3 ft, 4 ft, or 5 ft stands. The t.. Replacement targets for the Train Set. Each target is approximately 16 x 16. The targets are all 3/.. Replacement targets for the Train Set. Each target is approximately 16 x 16. The targets are all 3/8.. The Diamond target is a 12" static target. It can be mounted to the 3 ft, 4 ft, or 5 ft stands. The .. The Cactus Popper is 18" tall x 12" wide. This target can be mounted to our Large Auto Reset Base mo.. The Shooting Target Stand provides a means to mount all of our static targets. The stand is 23" wide.. The Cowboy Popper is 19" tall x 12" wide. This target can be mounted to our Large Auto Reset Base m.. Replacement targets for the Train Set. Each target is approximately 16 x 16. The targets are all 3.. The Target Stand provides a means to mount all of our static targets. The portable target stand is 2.. 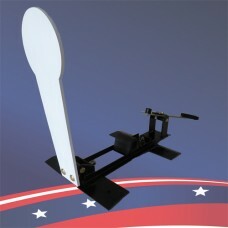 The Compact Target Stand can be used to mount nearly any of our targets from the mounting bracket on.. The Steer Head Target is an 18" tall x 14" wide target. It can be mounted to the 3 ft, 4 ft, or 5 f.. The Coyote Target is an 17" tall x 17" wide target. The steel animal target can be mounted to the 3.. The Coyote Target features reactive vitals that flip out when hit. The flapper immediately closes .. The Boar Target features reactive vitals that flip out when hit. The flapper immediately closes an.. The Stage Coach Target is an 17" tall x 24" wide target. It can be mounted to the 3 ft, 4 ft, or 5 .. The Wolf Howling Target is an 16" tall x 15" wide target. It can be mounted to the 3 ft, 4 ft, or 5.. The Deer Target features reactive vitals that flip out when hit. The flapper immediately closes an.. The Heart target is a 12" knock over. The target is made from 3/8" thick AR500 hardened steel for ex.. The Spade target is a 12" knock over. The target is made from 3/8" thick AR500 hardened steel for ex.. The Club target is a 12" knock over. The target is made from 3/8" thick AR500 hardened steel for ext.. The Diamond target is a 12" knock over. The target is made from 3/8" thick AR500 hardened steel for .. The Heart target is a 6" knock over. The target is made from 3/8" thick AR500 hardened steel for ext.. These club shaped steel knock over targets are 6". These custom steel cutouts are made from 3/8" thi.. The Spade silhouette steel target is a 6" knock over. The target is made from 3/8" thick AR500 harde.. These diamond steel knock over targets are 6”. These knock over targets are made from 3/8" thick AR5.. The Circle target is a 6" knock over. The target is made from 3/8" thick AR500 hardened steel for ex.. The Square target is a 6" knock over. The target is made from 3/8" thick AR500 hardened steel for ex..